Select your username in the top right corner of any page in PocketSmith. You'll be able to see your current subscription plan and when it will next renew. Head to Settings > Subscription & Billing or Subscription & upgrade. Here you'll see details of your current subscription plan and the next renewal date. 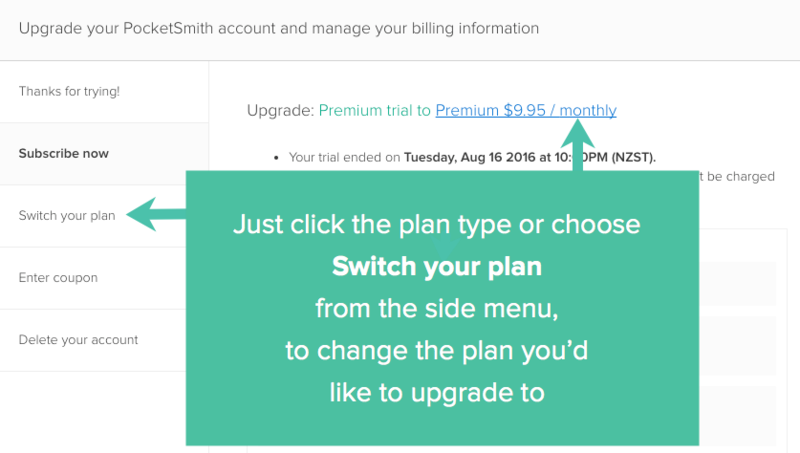 If you change to our Basic plan, your billing details will be removed from the system, however, your PocketSmith data (i.e. transactions, budgets, etc.) will be retained in PocketSmith. Be aware that this change happens immediately: as soon as you change to the Basic plan you will lose access to any Premium or Super subscription features. What happens to a subscription that is changed before the renewal date? If you change your PocketSmith subscription before its renewal date, the change will be applied straight away. If you'd like to downgrade your account before you are next charged, it's best to wait until close to the renewal date so you can still enjoy access to the paid features until then! I've downgraded my account and have lost access to the paid features straight away, can you help? If you downgrade your account before its renewal date but would still like access to the paid features up until that date, please get in touch!